Following the Conservative election victory on 07 May 2015, Cameron replaced Chris Grayling as Justice Secretary (Lord Chancellor) with Michael Gove. Gove was sacked by incoming Prime Minister Theresa May on 14 July 2016, and replaced by Liz Truss. This blog reflects on his achievements and failures in office. Gove was previously Education secretary, attracting controversy and unpopularity in equal measure. A review by Ian Leslie of Gove’s successes and failures , together with his challenges ahead as Justice secretary, was published here in the New Statesman. A piece by Tom Smith (writing for the Justice Gap) looked at the ongoing battle with criminal legal aid contracting and asked whether the approach to Gove should be Conciliation or revolution? 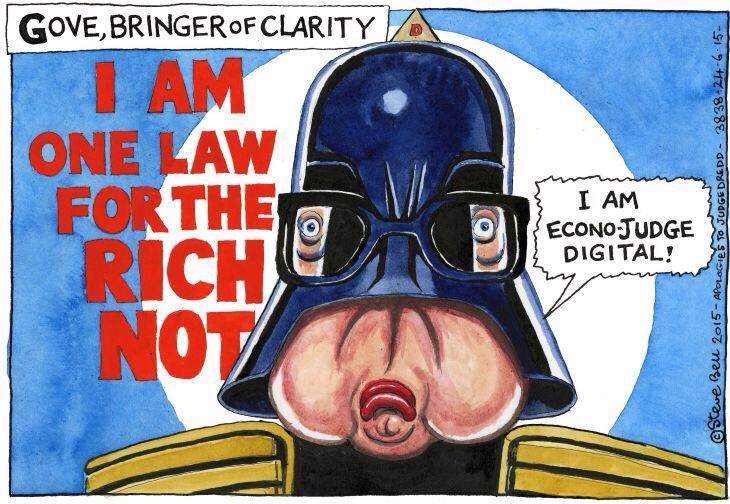 On 23 June Gove delivered his first policy speech since appointment, describing a “two-tier” system of justice. My reaction via BBC News in this clip. He identified the problem, but not the cause of the problem, making no mention of the Legal Aid cuts which led to two-tier justice. He also failed to identify the solution (proper funding) , instead preferring to focus on “improved technology and increased digitalisation” and the notion that there might be more “pro-bono” work from better-paid commercial lawyers who may want to dabble in social justice. Gove was a huge improvement on his predecessor, apparently wanting to take a constructive approach to a prison service in crisis. Eventually there were reforms set out in Queen’s speech (May 2016) but lacking the investment needed to really tackle the problems. He had however already overturned Grayling’s ridiculed and unlawful prison book ban. Goves efforts to extricate the MOJ from Graylings ill-judged commercial contracts with a despotic regime are explained here in an article by Jack of Kent. We were advised that Mr Gove was indeed willing to meet a representative of the London Defence Community, for an informal constructive chat, and his advisers would set up a meeting as soon as possible. That was confirmed in several emails, but never happened. Gove was invited to the LCCSA Summer Party, but failed to attend and was replaced with a G(l)ove puppet. In January 2016 Gove finally abandoned Grayling’s plans for a two-tier justice system with this announcement. This was welcomed by most solicitors (see eg LCCSA comment) Detail and comment in this piece in Solicitors Journal. Abolishing the Human Rights Act was seen by some commentators as both the most urgent and most difficult task in Gove’s in-tray (see eg this analysis by Joshua Rozenberg) In practice, Gove (sensibly) did absolutely nothing about it. During his period of MOJ abstinence Lawyers received the news about the “advisory committee” that Gove had promised in January (above) – but not from Mr Gove or even the MOJ – but from the apparent chair, Gove’s friend Gary Bell QC (aka “The legalizer“) in this article (TLS Gazette 24/05/16) Mr Bell appeared to have selected members of the Bar-dominated committee himself, comprising friends, colleagues and an instructing solicitor, leading the Law Society to question the diversity of the panel. Read more about Bell (and his controversial views on Solicitor-Advocates) here. Gove is married to DailyMail journalist Sarah Vine, a glimpse into their relationship was offered by an email from her to Gove that was accidentally sent to the wrong address and then published, as described here (Guardian, 29/06/16). See also her account of the day after Brexit as Reported in the Daily Mail on the same day. On 30 June Gove announced he was standing as a candidate to be the Conservative Party Leader (and therefore if successful, Prime Minister) . He did not resign as Justice Secretary. By 7th July he was out of the running, failing to attract support and generally ridiculed for his disloyalty. He was proved right about one thing – he was unsuitable to be PM. Meanwhile, judging by the content it appears that somebody other than Mr Gove had registered the Gove2016 website…..
Post Brexit vote, Gove was now a Minister waiting for the axe. He had unfinished business that had been on hold during his electioneering- continuing prison reform, and perhaps reforming the Court of Appeal (as argued by Julie Price in this powerful piece in the Justice Gap.) Theresa May sacked Gove in appointing her initial cabinet, having assumed office the previous day. Confounding expectations, Michael Gove was a better Justice Secretary than most criminal lawyers or legal aid lawyers could have hoped for, largely because he was an improvement on Grayling, which was admittedly a low threshold. Michael Gove spent the first half of his tenure undoing the damage inflicted by his predecessor and the second half doing very little. On that basis alone, he was quickly missed, and initial assessments of his successor were underwhelming -see this assessment of Liz Truss. He returned to the cabinet following May’s ill- judged “snap election” in June 2017. 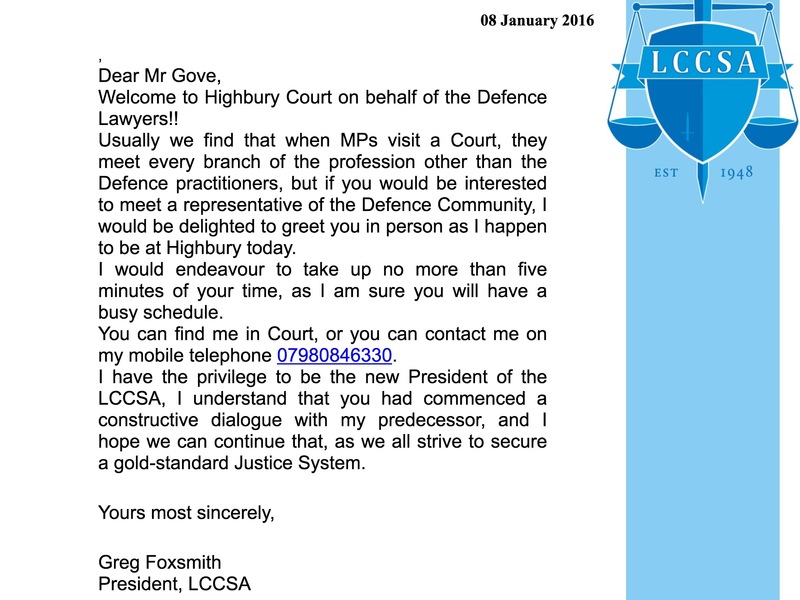 This entry was posted in Law, Legal Aid, Politics and tagged Grayling, Human Rights, justice, Legal aid, Lord Chancellor, Michael Gove on June 30, 2016 by Greg Foxsmith. 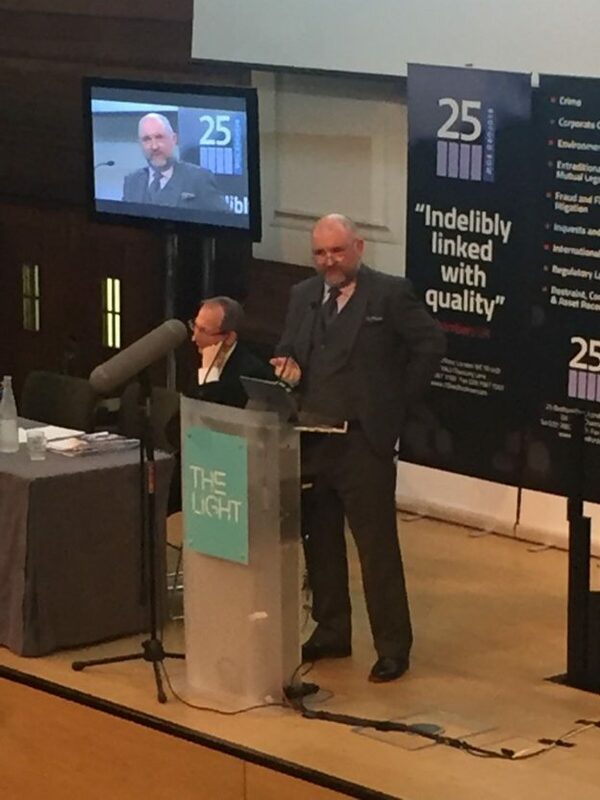 I have been asked to speak on the topic of “the victory”, or the “win” by which I think is meant the climb-down earlier this year by the MOJ in respect of two tier contracting. I have to say that this was very much a Pyrrhic victory, and although there was much relief, there was only muted celebration. Much time, energy – and money – had been expended on tortuously difficult tendering documents, much anxiety hanging on the results. Firms had closed or merged in anticipation of the outcome, or planned mergers. Solicitors changed firms- only some voluntarily. Some were bidders, some not, some “winners” some losers. Then when contracts were awarded, those unfairly left out were minded to challenge the outcome, potentially in conflict with those awarded contracts. What was Two Tier ? Accompanying another 8.75% fee cut, yes the follow up to a the first 8.75% cut we had already absorbed, TT was the controversial contract-tendering procedure which would restrict the number of law firms permitted to do duty legal work. It was hatched by the MOJ and initiated by Chris Grayling, the previous Injustice Secretary. It was supported -encouraged even- by some firms in the BFG. It threatened to wreak havoc on a supplier base acknowledged to be fragile, and for comparatively modest savings. This proposed enforced consolidation of the profession would have been effectively forcing many solicitors’ firms to merge or close. This, despite an acknowledgement that over the last parliament annual spending on legal aid was reduced from £2.4bn to £1.6bn. TT was wrong in principle, but to add insult to injury it was ultimately botched in application. Contracts were awarded, and a whistleblower revealed the marking had been carried out by unqualified temps from a recruitment agency. So unsuccessful firms took legal action against the MOJ…. In October EFBW were informed by the LAA that they had been narrowly unsuccessful in their attempt to obtain a legal aid contract for duty solicitor work in Hackney, Newham and Tower Hamlets. EFBW brought legal challenges (represented by Bindmans) against the results of the procurement process in all three areas. Almost 100 other firms brought similar challenges. The LAA then admitted that it made a basic transcription error in scoring at least one of EFBW’s bids, and that consequently EFBW should have been awarded a contract in Hackney. The possibility of such an error was identified by Bindmans in October, but was not addressed by the LAA in pre action correspondence and a formal offer of ADR was not taken up. The LAA sought to resist disclosure to other firms, and a Court order had to be requested. Even after disclosure, the LAA ignored requests to settle EFBW’s claim and proceeded to file a defence that admitted the error but failed to acknowledge the consequences. Only later did they acknowledge that if the error had not been made, EFBW should have scored higher than at least one of the purported successful bidders, and therefore should have been awarded a contract. The LAA still refused to settle the claim despite the fact that it should never have had to be brought, and summary judgement was sought. So, increasingly firms involved were confident of victory, but the case rumbled on. In January the SoS for Justice, MIchael Gove announced that the plans for two-tier contracting and the cuts of 8.75% to legal aid fees for duty criminal solicitors were to be suspended. This was a policy U-turn which followed many others, as Gove re-planted the scorched earth of the Grayling period. 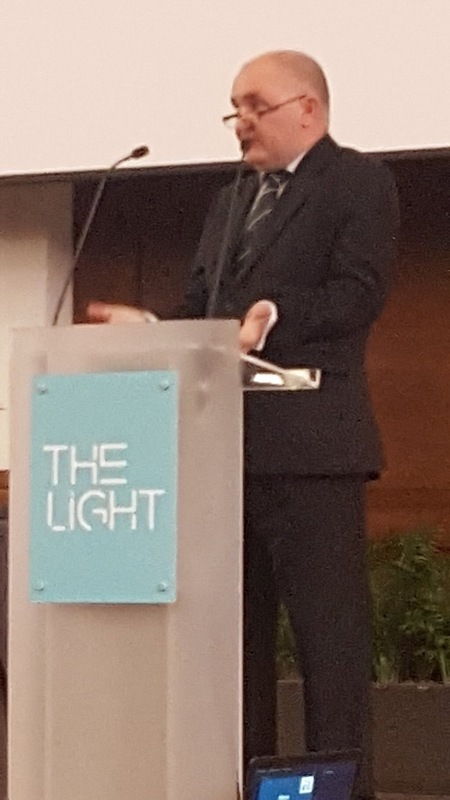 Announcing the about-turn in a Commons written statement, Gove pointed out that awarding a limited number of “dual contracts” – under which solicitors take on duty legal aid work at police stations and magistrates courts as well as represent their own clients – would lead to a less diverse and competitive market. 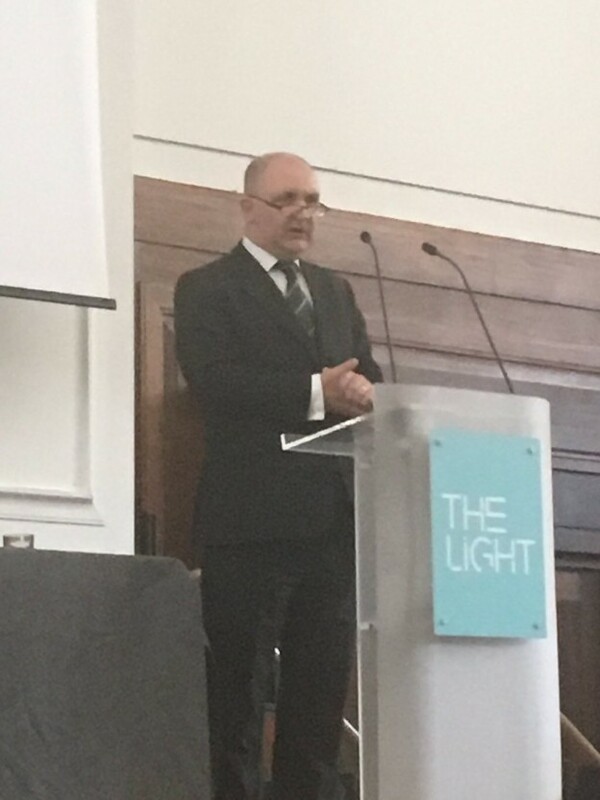 We had pointed out that natural consolidation was already taking place in the criminal legal aid market, as crime reduced and natural competition took place. Gove also accepted his department had already made substantial savings. ” it has become clear, following legal challenges mounted against our procurement process, that there are real problems in pressing ahead as initially proposed. My department currently faces 99 separate legal challenges over the procurement process, which has required us to stay the award of new contracts. So ultimately it was the lawyers wot won it, using the only effective tactic in our armoury- the law. two-tier contracts, single-tier contracts and lots- of -tears no contracts. Before the “victory” there were other battles in the ongoing war, with many skirmishes along the way. By ongoing war, I mean the continuing battle for legal aid lawyers to be properly paid. First there was a consultation, or bearing in mind it was from the MOJ a NONsultation. That was flawed, and had to be re-run. Then there was the tendering procurement scheme itself, and the JR in which we argued the whole scheme was irrational. The LCCSA was proud to have fought that battle, together with CLSA and TLS. Many of you contributed – thank you. That meant, despite generous donations, we depleted our reserves and gave our treasurer sleepless nights. So the fact that we have survived as an Association, with membership steady, and in a period of consolidation, is a victory of sorts. 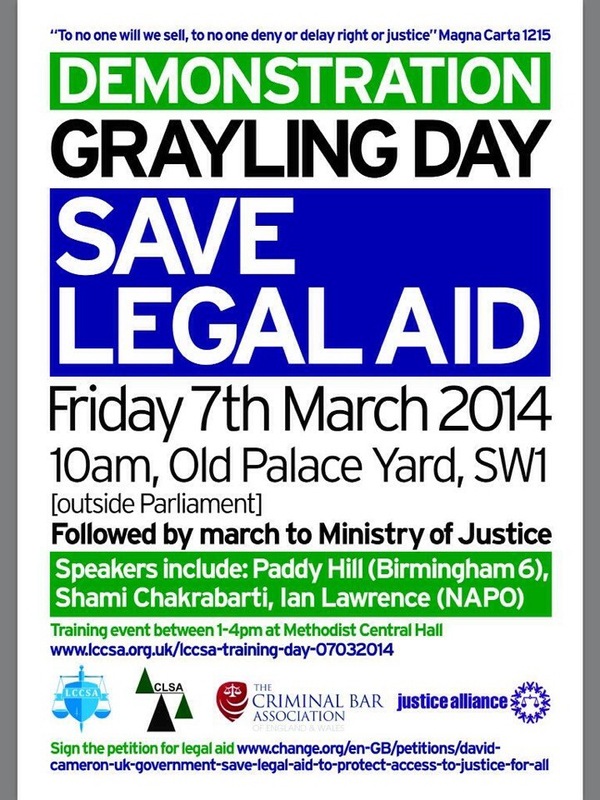 On the afternoon of the same day there was a national meeting attended by 1000 solicitors and barristers. On 4th June (the closing date of the first consultation) another demo organised by solicitors outside the MOJ again with considerable national publicity. By March the following year there was a day of action, a withdrawal of services from courts, called in some quarters a “strike”. We had a protocol where firms agreed to sign up no new legal aid cases. Only a small minority breached that, some reluctantly for vulnerable own clients only, and fewer still took an opportunity to clean up or profit. We learned solidarity, and began to trust each other. But the truth is so far as funding is concerned, for years we have endured a slow death by a thousand cuts, a sustained attack, and only belatedly we learned to fight back. We campaigned, protested, demonstrated, withdrew services, and went on strike. 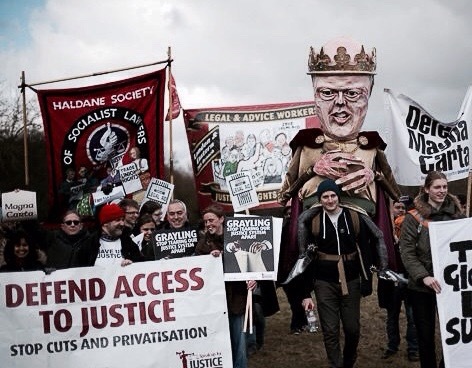 We battled the most odious and incompetent of Lord Chancellors, the infamous Chris Grayling. difficult man to engage with. Grayling, known by all as “failing Grayling” was described by JH as a “turd that couldn’t be flushed”.Grayling didn’t like lawyers, and the feeling was mutual. So, we rallied in Parliament square, outside Westminster Magistrates Court, the Old Bailey and MoJ HQ, and we walked from Runnymede to Westminster. And we took legal action against the MoJ, with our JR at the High Court. Much of this achieved little at the time, so maybe the “win” in January is something we should cherish. Right to legal aid is ‘basic human right’, Jeremy Corbyn told a Justice Alliance meeting at the start of this year. 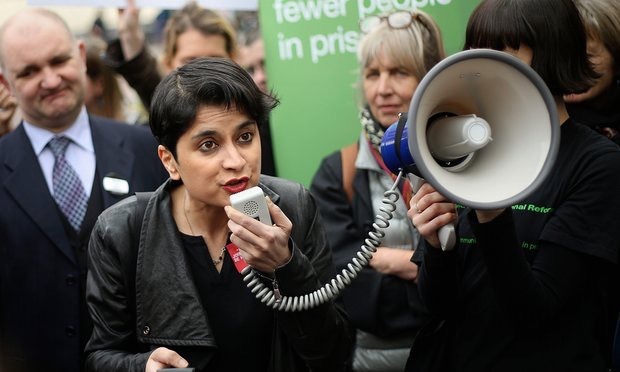 Whether you area Corbynista or not, the fact that the Leader of a Political Party – the leader of the opposition no less – not only mentions legal aid but does so in a supportive way is a significant development. Labour have initiated the Bach review into Legal Aid, and Gove has said that he is convening a committee or forum to discuss legal aid in a constructive way. There was nothing constructive about relations/negotiations with Failing Grayling, so the political landscape has certainly changed. Two years ago, Paul Harris spoke about the need for unity. At that time, relations between leadership of the criminal bar and solicitors had reached a low point. Last year Greg Powell again spoke on the theme of unity. This followed a slightly fractious period- relations between solicitors and our friends at the bar had become strained. Like an old married couple, we were bickering, but I think we are living comfortably together again now. At least until the next row! We are working constructively on proposals for AGFS and litigator fees to try and make sure we are all properly paid for the work we properly do. We can learn from what happened when Grayling successfully sought to divide and rule. The lesson of unity is a simple one, especially where we have a common enemy. There is always some horror lurking around the corner. Currently, during this quiet period when Michael Gove has become the SoS for Brexit, our friends at the Sentencing Guidelines Council are consulting on the amount of credit for guilty pleas- and with some alarming proposals out there to reduce the incentive if the client didn’t cough and confess at point of arrest. Yes its acronym time – Bloody Case Management, Dire Case Systems and Pressure to Plead Hearings. A good idea in principle- less hearings, less paper. But the underlying problems have not gone away -inadequate disclosure, late disclosure, lack of legal aid, problem getting prison visits etc. Thankfully there hasn’t been further devolution to the Central London Implementation Team, or the South Hampstead Implementation Team, the anacronym of which may best sum up the whole mess. Gove didn’t just abandon two-tier tendering. He forced the government to cancel a £5.9 million contract to advise the Saudi Arabian prison system. He scrapped the commercial wing of the Ministry of Justice after human rights concerns. And Gove abandoned plans to build a £100 million “secure college” for teenage prisoners. He popped up at HCMC at the start of this year on a day where I also happened to be there, and as he was meeting everyone but the defence I ambushed him with a letter requesting a meeting, and he agreed. But perhaps no news is good news. We have had enough of diktat and pronouncement by highly paid civil servants at the MOJ , and we have had enough of cuts. We cannot take any more. The sustainability of the justice system relies on proper preparation and presentation of cases. We all play our parts- barristers and solicitors. Brothers and sisters in arms. So yes we had a victory in January, but let’s not be fooled- that was a battle, and so far as legal aid is concerned there is an ongoing war. At least we no longer have Grayling, who managed to combine total war with Cold War. But depending on the outcome of the Euro Referendum, we may not have Mr Gove much longer, and who knows who will succeed him? Thankfully, we have put the banners and t-shirts away, at least for now , and gone back to our core business- training events, representing criminal lawyers in London whether doing legal aid or not, and of course our famous social events. Which presents me the chance to do my one “plug” – the LCCSA Summer Party, July 8th! So it’s a half- cheer for the Victory in January, and a relief that we can get back to our day jobs. Some of us will always remember where we were on the day when we heard the news of Gove’s announcement abandoning two-tier. I certainly remember going to the pub to meet fellow lawyers to celebrate the victory. Unhappily, I was in “dry January” and celebrated without the assistance of alcohol. That bleak month has long passed, and I promised not too keep you too long from your drinks. So I hope to see some of you in the pub- Steve has the details- and let us raise a glass to justice, celebrate solidarity, drink to the health of legal aid, and share a toast -to Victory. This entry was posted in Advocacy Availability, Civil Rights, Featured, Law, Legal Aid, Politics and tagged CLFS, Gove, Legal aid, tendering, victory on May 13, 2016 by Greg Foxsmith. Criminal Legal Aid Lawyers of certain experience can apply to become duty solicitors. Duty Solicitors can represent people needing legal advice in criminal courts who have not instructed their own solicitors, and do so in rotation via a published rota administered via the Legal Aid Authority. The MoJ and LAA will soon be considering how to allocate duty “slots” when the new rotas are published, and how to tackle ghosts. Ghosts’ have flourished in plain sight as named Duty Solicitors on rotas for years. ‘Breaking the link’ by replacing Duty Solicitors slots in firms names will only serve to perpetuate this problem by providing ‘Ghosts’ with additional protection from detection. We have successfully challenged the implementation of Contracting Duty Solicitor work by asserting it would drive down the quality of fundamental front line services at the police station and magistrates court. ‘Breaking the link’ would rapidly evaporate this achievement and facilitate every ambition the Contracting proposals set out to accomplish. The prestige of PIN numbers would become meaningless. Every firm would have the tempting opportunity to replace highly experienced DS, employees and consultants alike, with inexperienced bargain-basement representation. The provision of quality services can only be preserved by maintaining the link between named and appointed DS on rotas. For those representing the profession in current crucial post Contract negotiations, the last bastion of guardianship must be to protect this link with the same tenacity which defeated the ill-fated Contracting proposals. 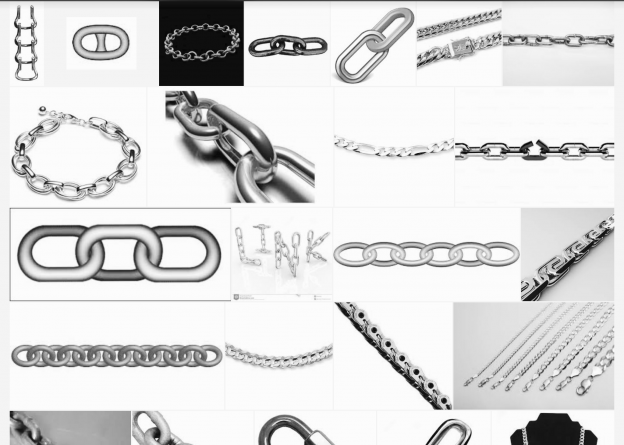 Keeping the link is important to all duty solicitors, not just freelancers! Solicitors in London who want to contribute to the debate should consider joining the LCCSA, a representative body with a democratically elected committee. In addition, Freelancers may want to attend a meeting for Freelance Solicitors at the Queens Head in Kings Cross on Monday 15th February at 6pm, or contact Theresa Hendrickx by texting 07949243949 for more information on the Freelancers Association mailing list. * The Big Firms Group” (or BFG) is an unelected body set up to represent the interests of “big firms” with a Criminal Legal Aid contract. There has been a doubt for some time as to whether they are a unified body and who exactly they speak for. It may only be a small number of firms with other firms historically under the BFG umbrella not wholly in support of recent positions. However, what is clear is that spokespeople for the BFG lobbied the MoJ in support of consolidation (and were supporters of the disastrous “two-tier” contracting) and appear to still be recognised as a “representative body” by the MoJ, despite apparently having no clear mandate or constitution. This entry was posted in Advocacy Availability, Featured, Law, Legal Aid and tagged Breaking the Link, criminal, criminal law, Duty Solicitor, Freelance, Legal aid, Solicitor on February 12, 2016 by Greg Foxsmith. 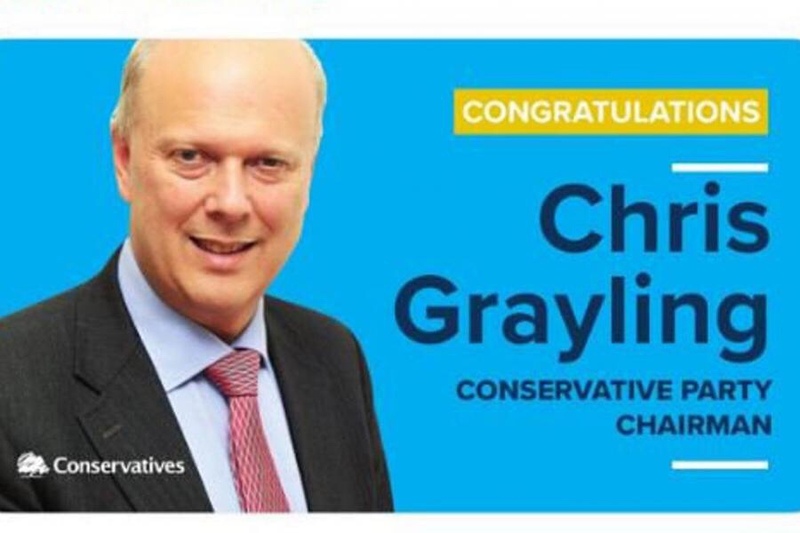 Born on April Fools Day, Christopher Grayling MP (Conservative MP for Epsom) was the Justice Secretary and Lord Chancellor from October 2012 to May 2015. He was the first non-lawyer to have served in that post. This blog reviews Grayling’s tenure in office as Lord Chancellor. 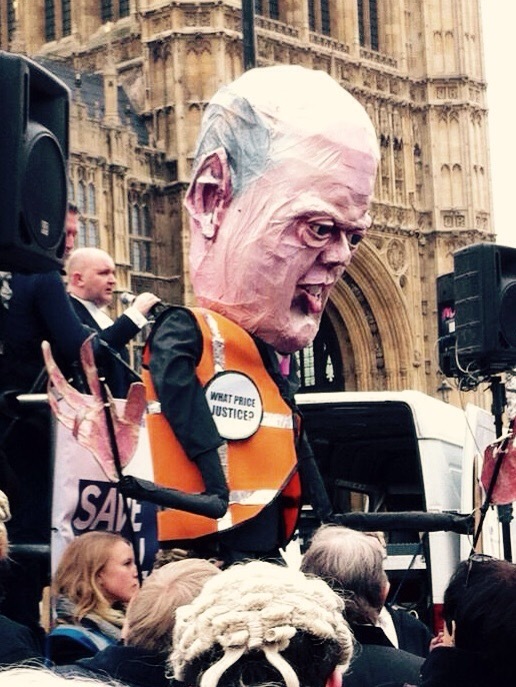 2014 review of a year in the life of Christopher Grayling (with links) as reported in the “Tuesday Truth” blog. Chris neeed a good secretary, so the taxpayer forked out for him to have a secretary (at an eye-watering 40k pa) . Luckily, someone was available for the job- no need to advertise! The ideal candidate? Step forward Mr Graylings wife- susan! Grayling had supported, despite overwhelming opposition in the preceding “consultation, a new model for payment of criminal league aid solicitors known as Price Competitive Tendering, which was so flawed even the Mail on Sunday criticised it ( enjoy this Downfall parody video with Grayling stabbed in back by MoS ) Legal Aid had already been cut to the bone, before Grayling set to work with cuts to all areas of legal aid. Criminal Lawyers even went on “strike” (January 2014) Grayling did not back down, the LCCSA took legal action, and a year later (under Grayling’s successor) the Government caved in and the scheme was abandoned. Guardian article on rising suicide figures exposing prison crisis, and subsequent letters. Lord Ramsbotham speaks out against Grayling over the prison suicide crisis. Grayling makes Chief Prison Inspector reapply for his job. Grayling dismisses huge increase in prison suicides as a “blip“. Grayling’s legacy will be to have left prisons in a worse state than he found them. Authors use Chris Grayling as villain in response to the book ban. “Strange and absurd” -Court Judgement on Grayling and the book ban. Having lost on his prison- book-ban, Grayling delays implementation and is described as “stealing Christmas“. The sad truth is, Grayling doesn’t actually understand Human Rights, and even the Daily Mail had to correct him- see this article. The MOJ “deal” with the Saudi regime represents a clear conflict of intetest as set out by Jack of Kent in his informative argument. 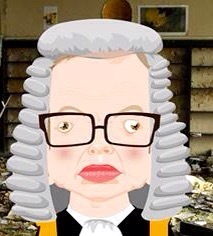 Gove has done his best to extricate the MOJ from Grayling’s toxic legacy -update here. BACKGROUND:- this website has info about Magna Carta, it’s historical significance then and now, why we should celebrate it and how the Government has hypocritically hijacked the anniversary. 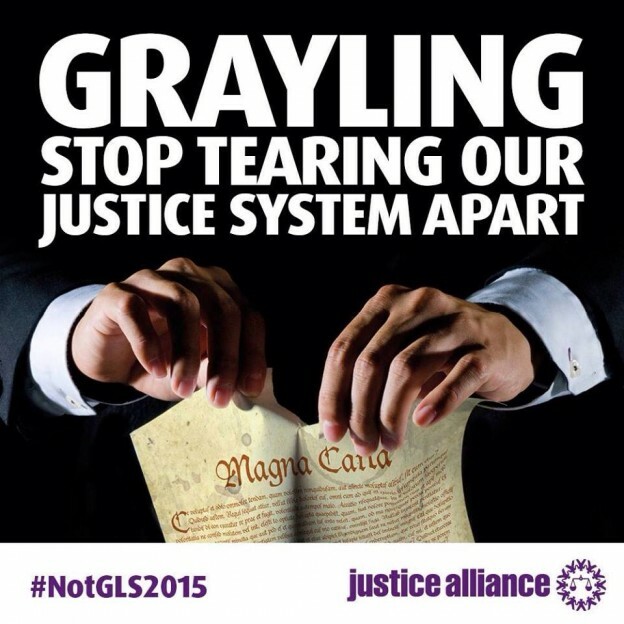 Grayling is a hypocrite with his MOJ event to commemorate Magna Carta (argues Peter Oborne) – don’t jump on the bandwagon! 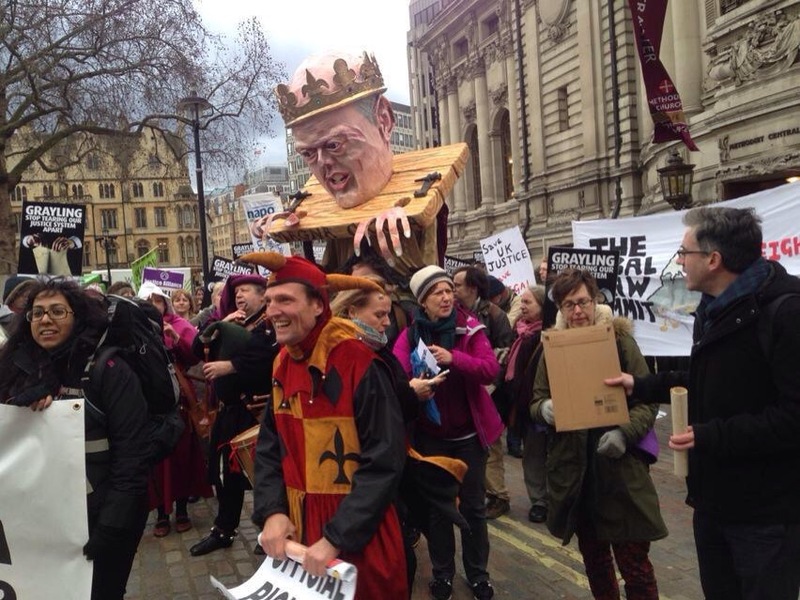 Robin Murray spells out the hypocrisy and called for a boycott of Grayling’s Magna Carta event. More here on why principled lawyers would not attend. In the 800th anniversary of Magna Carts (see below) a RELAY FOR RIGHTS saw demonstrators walk from Runnymede to Westminster to protest against Christopher Grayling and his preposterous, hypocritical “Great” Legal Summit. This led to a public Impeachment for the man masquerading as Lord Chancellor. See also this article on Grayling and Magna Carta in the New Statesman (Feb 2015) by Anthony Barnett. in this article we find out what Grayling thinks , with critical analysis. Unfavourable comparison with his successor here in the Spectator. For many months we heard nothing about Grayling. Then it emerged he had been granted permission to campaign in favour of Britain leaving the EU in the forthcoming referendum, and he became a self appointed leader of Brexit. Grayling’s support for “out” caused celebrations in the “in ” camp, as Grayling (a “sheep in sheep’s clothing”) proved that he has “yet to discover an argument he has consciously been on the right side of” (read the full sketch by John Crace 14/01/16) However, as we now know, the Country did vote to Brexit, although few have cited Grayling and his support as having been an influential factor in that. In 2017 Grayling supported Heathrow expansion, and Monarch Airways went bust. In October 2017 Grayling attending the launch of the new hybrid train between Bristol and London. A service that not only arrived into Paddington 45 minutes late after the train broke down while switching from diesel to electricity, but whose air conditioning had failed, drenching dozens of passengers with water. That it took nearly half a minute to realise the mistake was a surprise: most people don’t need nearly that much time to work out that Grayling is invariably the wrong person for any job. Grayling was trending again on twitter (and not in a good way) in June 2018 after ongoing train cancellations and timetable shambles. Chris was supposed to meet MPs but had to cancel some meetings after he didn’t timetable them properly (I’m not making this up) and then gave a statement in the house where he said that those responsible should resign. “It’s completely unacceptable to have someone operationally in control and not taking responsibility,” Failing Grayling declared hysterically. At that moment, satire died. 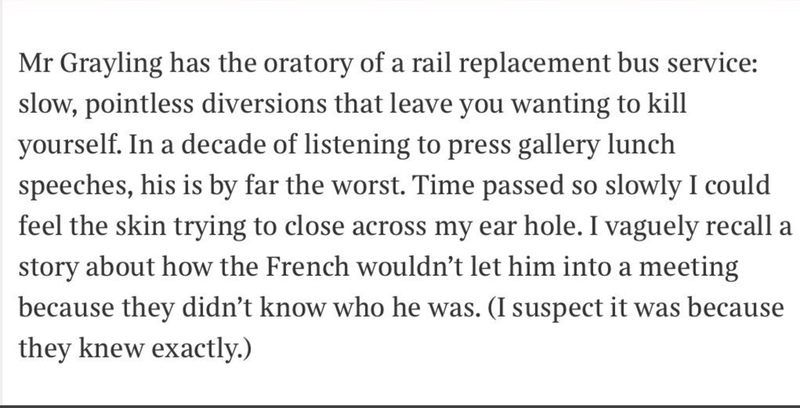 (Full sketch by John Grace here, and here is a further extract: If you were writing a new series of The Thick of It, you’d hesitate to create a character like Chris Grayling for fear no one would believe in him. Even in the current cabinet, a confederacy of dunces where the sole qualifications for membership are being a bit dim and entirely incompetent, the transport secretary is a class apart. To say that Failing Grayling has more than his fair share of bad days is a category error. Because that implies he has the occasional good one. He doesn’t. Every day is a desperate, losing struggle against the chaos caused by his own hopelessness. But even for a man who has turned his failure into a monumental work of performance art, Monday hit a new low. Or, as Grayling might see it, a total triumph. The moment he formally achieved the coveted status of the idiot’s idiot. 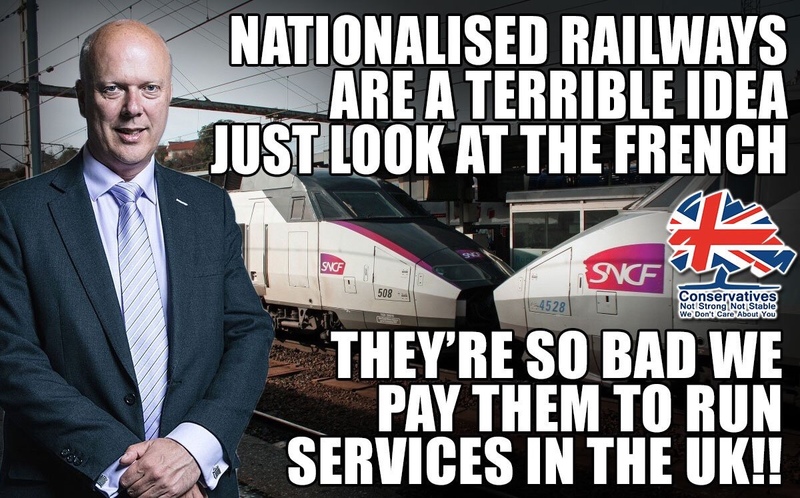 Chris Grayling used the publicly owned French railway as an example of how bad a UK nationalised railway would be…yet we pay the French rail to run private UK services and UK fares can be 4x more expensive for similar journeys. This entry was posted in Civil Rights, Featured, Law, Legal Aid, Politics, Uncategorized and tagged Chris Grayling, Grayling, Legal aid, Lord Chancellor, magna carta, MP expenses, prison on January 20, 2016 by Greg Foxsmith. The most recent You-Gov poll on access to justice found that 84% of people said legal aid and a fair trial were fundamental rights. I agree! 4. I will support a review of access to justice within the first year of a new parliament to consider the effect of cumulative cuts and changes to legal aid funding. 2 See Here for covering letter inviting PPCs to sign the Justice Pledge. This entry was posted in Featured, Law, Legal Aid, Politics and tagged #Vote4Justice, election, Legal aid, pledge for justice on April 20, 2015 by Greg Foxsmith. Will the last 1 please turn out the lights? This entry was posted in Civil Rights, Featured, Law, Legal Aid, Politics and tagged Grayling, Human Rights, Legal aid, poetry on March 21, 2015 by Greg Foxsmith. This blog is by Penelope Gibbs of TRANSFORM JUSTICE. Transform Justice was set up in 2012 by Penelope Gibbs, a former magistrate who had worked (successfully) to reduce child and youth imprisonment in the UK. The charity aims to help create a better justice system in the UK. This entry was posted in charity, Civil Rights, Guest Blogs, Law, Legal Aid and tagged criminal justice, Legal aid, Penelope Gibbs, Tansform Justice, unrepresented defendants on March 11, 2015 by Greg Foxsmith. 0n 21st February 2015 the Justice Alliance met in Runnymede and set out for Westminster as part of a JA event called Relay for Rights. 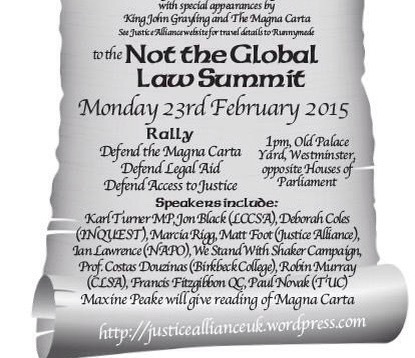 This finished on 23rd February with the “NOT THE GREAT LEGAL SUMMIT” In Westminster. This was organised as a direct response to the hypocritical “Great” Legal Summit, which in the name of Magna Carta, was being used to promote the kind of law that in fact has no resemblance to the principles still celebrated from that historic document. 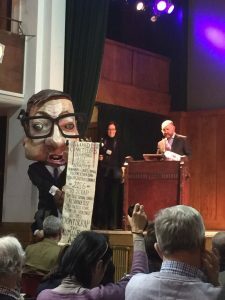 At the alternative event, on the inspiration of Justice Alliance member Rhona Friedman, I was asked to seek impeachment of the Justice Secretary Chris Grayling by asking the assembled crowd to vote on “articles of impeachment” . Summary: One Resolution consisting of four articles of impeachment. The original King John had ruled using the principle of “force and will”, taking executive and sometimes arbitrary decisions, justified on the basis that a king was above the law. 800 years later, Chris Grayling, a man posturing as Lord Chancellor, takes executive and arbitrary decisions, and by seeking to remove the rights to Judicial Review attempts to place himself above the Law. As Secretary of State, King John Christopher Grayling provided false and misleading evidence to the House of Commons regarding Judicial Review Reform, having either knowingly lied in order to try to get his bill past the Commons or fundamentally misunderstanding his own legislation. The Secretary of State further provided false and misleading evidence to the Commons about probation privatisation projects in that G4S and Serco confirmed they had been granted new government work during a period when Grayling had told MPs that contracts would not be awarded Remember SERCO are the robber barons who claimed for supervising the dead! TO THIS ARTICLE DO YOU THE PEOPLE FIND THAT KING JOHN CHRISTOPHER GRAYLING HAS MISLED THE COMMONS AND THE PEOPLE? TO THIS ARTICLE DO YOU THE PEOPLE FIND THAT KING JOHN CHRISTOPHER GRAYLING HAS OBSTRUCTED JUSTICE? 3. Whilst holding the title of Justice Secretary, he has practiced,supported and embodied INJUSTICE, and has been defeated repeatedly in the Courts. TO THIS ARTICLE DO YOU THE PEOPLE FIND THAT KING JOHN CHRISTOPHER GRAYLING HAS ABUSED THE POWER VESTED IN HIM? 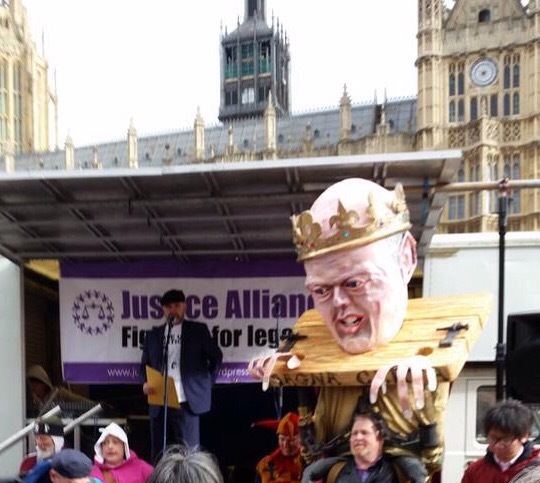 AS Lord Chancellor King John Grayling is charged with upholding the Rule of Law – We the people have by the above articles found him guilty of misleading Parliament , obstructing justice and abuse of power. Do you the people therefore think he has properly discharged his constitutional duty in accordance with his oath of office to ensure the provision of services for the efficient and effective support of the courts? TO THIS ARTICLE DO YOU THE PEOPLE FIND THAT KING JOHN CHRISTOPHER GRAYLING HAS ABUSED HIS OATH OF OFFICE-HOW SAY YOU, AYE OR NO? Lastly do we the people on this fake anniversary of the Great Charter find him to be an Upholder OF THE RULE OF LAW? AYE OR NO ? 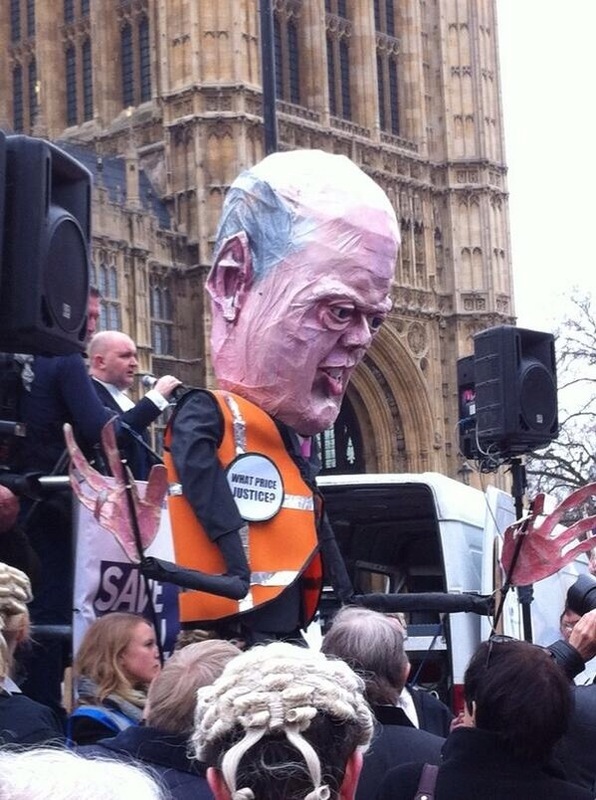 KING JOHN GRAYLING WAS DULY IMPEACHED- SO SAID WE ALL! But alas, he stayed in, and the will of the people once again was overborne. 800 years after it was sealed, people still remember the Magna Carta. Grayling, if recalled in history at all, will be remembered about as fondly as his medieval predessor, the hated King John. This entry was posted in Civil Rights, Featured, Law, Legal Aid, Politics and tagged Grayling, Legal aid, magna carta on February 22, 2015 by Greg Foxsmith.